Unlike most of the social media challenges that emerge, this is one that you can actually try at home without risking your life. A new internet craze has emerged and all it involves is touching your belly button by reaching behind your back and around your waist. 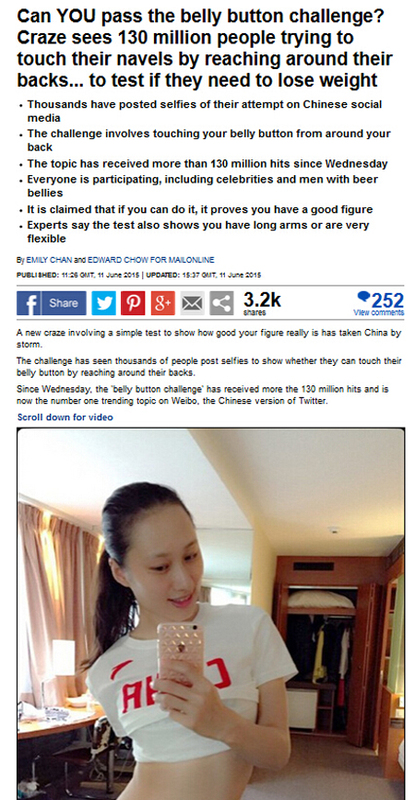 The belly button challenge originated in China where thousands of people uploaded selfies of them with their hand wrapped around their waist. 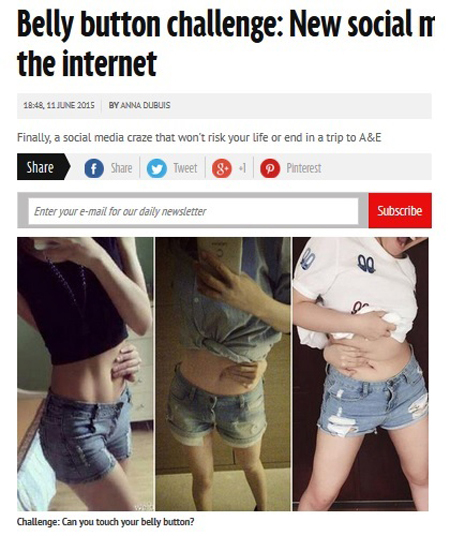 The posts were accompanied by a hashtag, which translates as "reach your belly button from behind to show you have a good figure". “反手摸肚脐”，老外叫它reach your belly button from behind 或者touch your belly button by reaching behind your back and around your waist. I can barely reach my belly button from the front, never mind going round the back!!!! What if you just have really short arms. I can reach the middle of my back! Is that good?!? This is just another fad to make young girls feel fat. Don't worry girls, so long as you can put your ankles behind your head, you will do perfectly.